Part 1 took place last October, as I was walking along the pathway from Richmond Lock to Kew, beside the edge of the Old Deer Park. 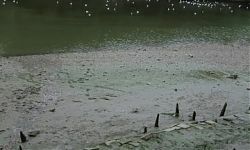 I had read in one of Niall’s blogs that the tides were low at this time and luckily, I did have my camera with me, as I suddenly noticed that along the foreshore were old posts popping up above the mud at various intervals. Maybe they hadn’t been seen before? I took some photos until the camera’s battery died which was about the area opposite The London Apprentice in Isleworth, where I held my first trowel. 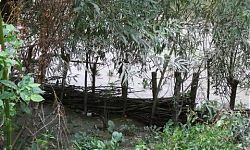 At one point, a large rectangular area appeared to be enclosed by the off shoots of the osier of the wattle of the fence. 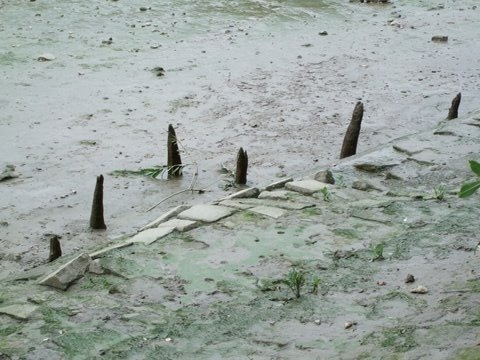 Could it have been a place to tie up a boat ? (When watching my daughter rowing at Chester I noticed the same configuration on the riverside.) 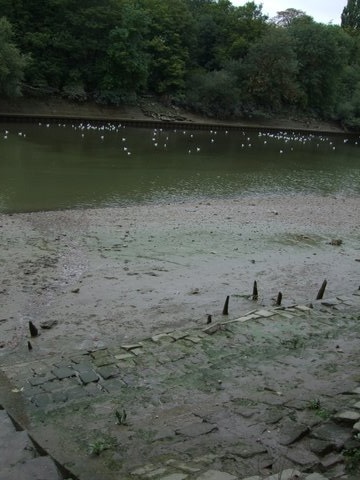 I didn’t have a map with me so the areas of the posts are not pinpointed but I think they start about the middle of the Isleworth Ait. Part 2 took place early this year when I visited Richmond Town Hall to see if there was any information about Old Brentford. At the TDP Foreshore Forum last December, a question was raised “did Julius Caesar ford the Thames near Brentford?” I had looked at some old maps and the street names etc. seemed very interesting. 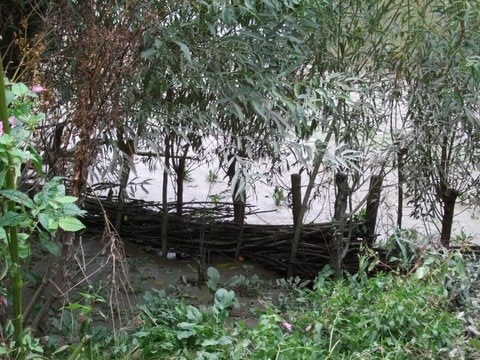 Due to the knowledge of the volunteers and interest in the Thames Discovery Programme I didn’t achieve my aim. What I did find were old paintings of the area of the Thames where I had taken the photographs. Fisheries were shown. Not just two but there were seven between Petersham weir through to Holgill’s Weir, which was east of Strand-on-the-Green. (One thing I didn’t do was to make a note of the date of this map !). 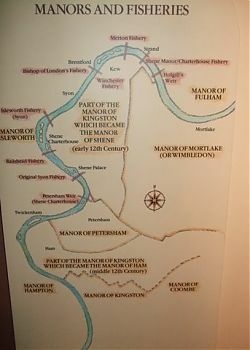 At Sheen Palace, there was the Syon Fishery, then the Railshead Fishery, the Isleworth Fishery, the Bishop of London Fishery, the Winchester Fishery at Brentford, then the Merton Fishery and finally the Sheen Manor/Charterhouse Fishery. So was the large rectangular area a place to keep fish fresh for a feast in the Palace or a feature of the twentieth century?